I couldn’t be happier with the result of multiple recipe tests. 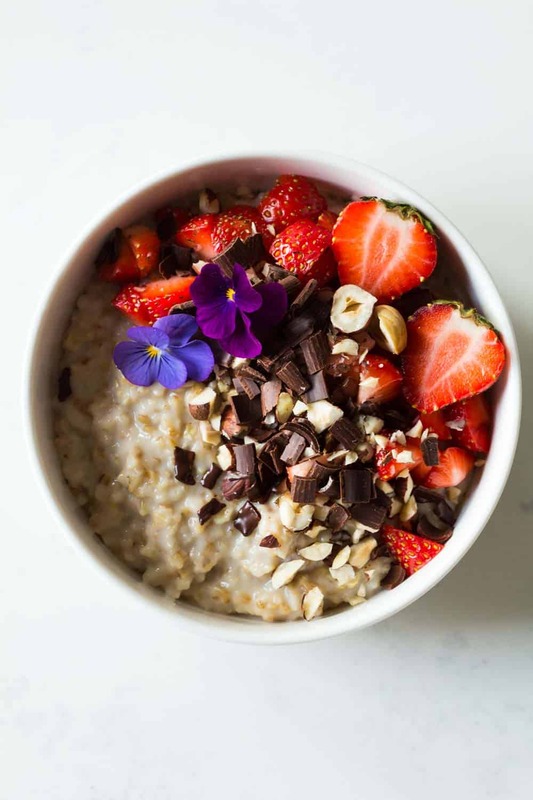 I LOVE LOVE LOVE steel cut oats, just as much as I love Instant Pot brown rice. Both taste so much better than their more processed cousins. They are obviously also healthier than their cousins. However, they used to have one disadvantage that was so dominant, that I didn’t make them much: they take forever to cook in a regular pot! Ever since I own a Pressure Cooker I can’t get enough of brown rice and steel cut oats. YUM!!! This amazing Instant Pot does ALL the work without assistance or supervision and it does the work much faster than a regular pot. ALSO, it just cooks stuff so much better. Quinoa, rice, oats…they simply come out perrrrfect! My absolute favorite part about having a pressure cooker now though is probably that I can cook complete meals in it such as Peruvian-Style Chicken and Rice. Hands down water!! For many reasons. Cooking milk under high pressure kind of end ups super weird. The best advantage of cooking steel cut oats in water, however, is that they will taste “neutral”. They are low fat, vegan and basically tasteless. They just have an amazing texture with which you can now work to transform into your favorite breakfast bowl. Besides, if you add cold milk it helps speed up the cooling process. There is no harder thing to do in life than sit in front of a boiling hot bowl of oats unable to eat them despite blowing and blowing on them until you feel like you’re going to faint. Add ice cold milk, give it a quick stir and it’s ready to eat! Let’s talk about timing! And let’s get into the details of quick pressure release and natural pressure release here. After extensive testing, I figured out 3 minutes on high pressure breaks down the grain but it needs natural pressure release to get silky smooth without falling apart. Imagine boiling your steel cut oats in constantly boiling water and eventually when it’s cooked take it out of the water, just like you would cook pasta. Ever tried? Why not? Nobody suggests doing that, right? Because it simply doesn’t turn out well. The oats overcook and absorb way too much water that way. They become a big mush tasting like absolutely nothing because it’s full of water. You have to “steam” oats but they also need to absorb enough water so they break down. So the magic formula is 3 minutes of pressure cooking to break down the oats and 16-18 minutes natural pressure release to “steam” them so they can absorb the exact amount of water necessary. 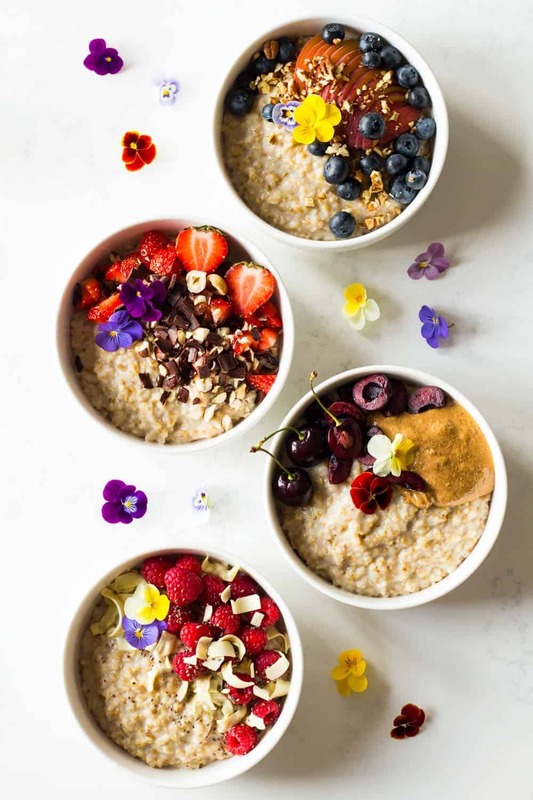 In case you’re wondering about timing for rolled oats as well, I recommend you read through this Instant Pot Oatmeal Jars post which goes into all the details about rolled oats and also, how amazing do they look?!?! How does strawberry, hazelnut, and dark chocolate sound? I thought so. This one was gobbled up in less than 3 seconds by my daughter. This almond butter and cherry bowl I chose for myself because the combination of nut butter + cherry is UNBEATABLE in my opinion. It’s absolutely amazing and I’m always looking for ways to add healthy fats to my diet. 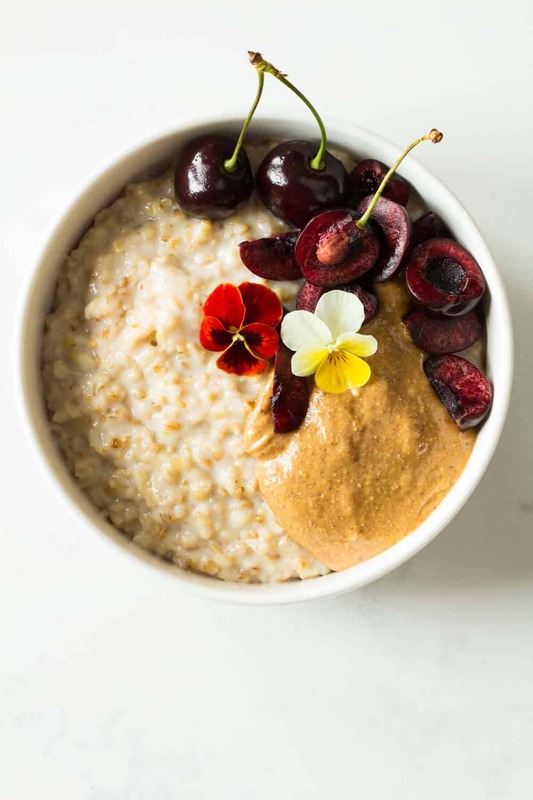 Nut butters are an extraordinary healthy fat and taste soooo good mixed into steel cut oats! Raspberries mixed into steel cut oats taste uh-mazing. The slight sourness and at the same time sweetness offer a feast for your senses. It was super hard to leave the peach, pecan, blueberry bowl for my husband. We saved it for his breakfast the best day but only after each of us giving it a small (ok, who am I kidding?) BIG bite to try how it tastes. OMG!!! Sooooo goood!!! Pecans and peaches and instant oats were probably married in their past life. Seriously! 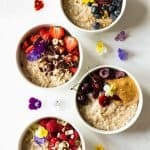 Now tell me, which Instant Pot Steel Cut Oats Bowl will you try first? Which one do you think will be your favorite and which one ended up really being your favorite? You know what? I tried them all and I can’t make up my mind!!! Preheat instant pot by pressing the "saute" button. Once hot, add coconut oil and once melted steel cut oats in order to toast them for a little (about 2 minutes) while constantly stirring. Add a pinch of salt and water, give it a quick stir and cover with lid and seal. Press, "cancel" then "manual" and adjust time to 3 minutes and pressure to "high pressure". Go take a shower or do whatever else you have to do for the next 20-ish minutes. The pot will take about 3-5 minutes to get to pressure, 3 minutes for cooking and 16-18 minutes for natural pressure release). Once the pin dropped (if it doesn't drop after 20 minutes manually release left over pressure, there should be close to nothing in it anymore), open the lid, add maple syrup and your milk of choice a little at a time while stirring until you reach desired consistency and wetness of your oats. Some like it drier others swimming in milk. Top with your favorite topping combo (see notes or photos) and dig in! 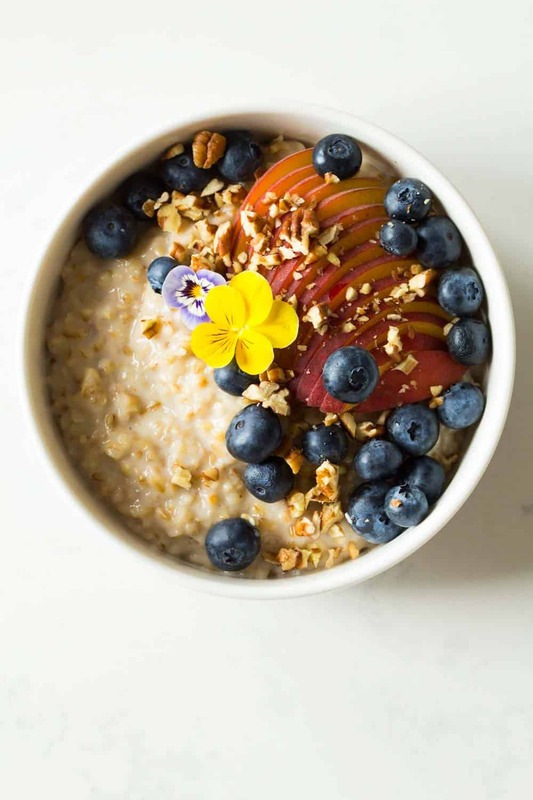 You can store the steel cut oats with milk and sweetener but without toppings in an air tight container in the fridge for up to 3 days without a problem. I have been following your recipe for the last week and a half in the cafeteria that I am managing. I bought an 8 quart Instant Pot for the express purpose of making whole grain hot cereals in the morning. The problem I have been having part of the time is that I get the burn food sign coming on. It isn’t exactly burned, but it is sticking, so I have to take the oats out of the pot, clean the pot and put the oats back in. The problem is that I have to figure out the fool proof system before I can delegate it to a student and feel like the cereal will be made with success and no problems. Diane, I’ve heard from many people that the 8-quart is a lot trickier because of exactly this reason. It seems to get the burn warning all the time. How much are you making in them? The amount I suggest here or double? I would start the troubleshooting process by doubling the recipe as the surface of the 8-quart is bigger. Yes, Pressure Cook and Manual are the same button just new and old model. The knob has to be on sealing. Otherwise, it will never come to pressure. I’d like to add quinoa to my steel cut oats so that I stay full longer. Could I use this same recipe and just replace some of the parts with quinoa? Hi Rachel, yes, you can do that. Quinoa takes 1 minute + NPR so it will definitely cook through during the 3 minutes + NPR. No problem at all. Hi! Would I need to change anything to make this in my 8 quart IPot? I love Stell Cut Oats and your recipes look great! Hi, you just have to check what the minimum liquid requirements are for your instant pot. I believe it’s 2 cups so you should be fine. I think your can follow the recipe as is. I’ve used your method several times with 100% success. Thank you!!! Do you think a pot in pot method would work for a smaller batch? Would I put the 1/2 ratio in the smaller pot and a cup of water in the inner pot as well? I don’t like experimenting if it might cause a waste of food. Hi Beth, do you have a 6qt like me? I’ve successfully made this recipe with as little as 1/2 cup steel cut oats and 1 cup water because the 6qt only needs a minimum of 1 cup water to get to pressure. I sometimes help it a little when it’s about to get to pressure I press down the lid so it seals faster and the pin jumps up before too much water evaporates through the pin hole. Otherwise yes, I think the pot in pot method should work. Put 1 cup water in the bottom, then the trivet, then your pot with oats (no need for a lid), add as little oats as you want, double amount of water and then proceed as instructed here. Thank you for this post. It was really helpful. My oats came out perfectly. I’m soooo happy to read that!!! 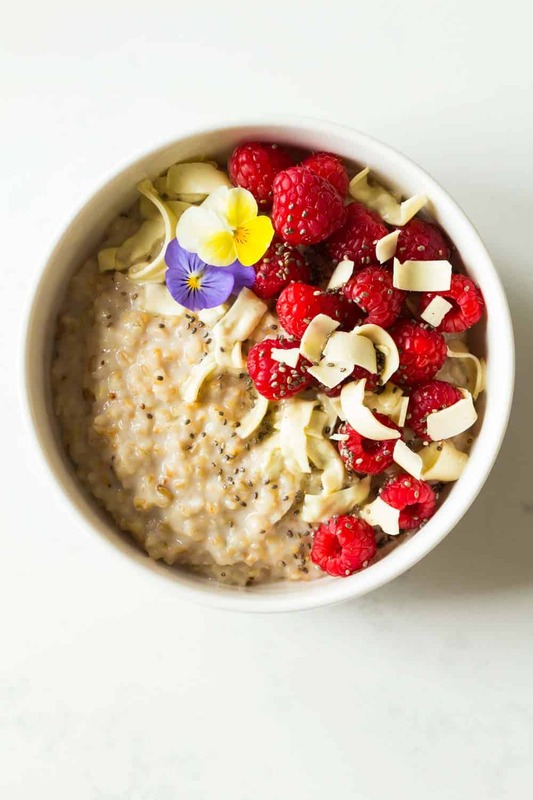 Hi Lorena, had a busy couple of weeks so not had chance yet to try any of your recipes BUT I have been doing porridge oats every evening using the timer function! Took me a few attempts at getting the water/oats ratio just right for my liking but I’ve about perfected it! Using your methods as a rough guide I have been using 40g oats with 200-300mls of water, depending on what time I set them for, so the later I set the timer the less water I need. I also stir in a teaspoon of green tea powder when I prepare the oats for a morning boost. Timer finishes at 6am so by the time I come downstairs at 6.30 my oats are lovely & thick ready to stir in some homemade Instant Pot yoghurt & top with blueberries or raspberries (or both!) and that’s me good to go for the day! Now to convert your Peruvian Green Rice recipe for the Pot, I have a huge bunch of coriander to use, it’s my favourite herb (and basil!!). If I make a batch of it how long do you think it will last in the fridge? I’m hopong to make it on Sunday and divided it throughout the week for a quick breakfast. Thank you! I make it on the weekend and freeze the oats in microwaveable containers sized by breakfast portions. (I make enough for 5 portions). I take out the frozen portion the night before otherwise they take forever to reheat. I also put my toppings in a separate container. In the morning, I reheat the oats in the microwave (stopping every minute to stir. Usually takes 2 to 3 minutes). I then add the toppings. Quick Breakfast!! What is the purpose of the coconut oil in this recipe? I am wondering if it Is necessary or if there are alternatives I could use instead? 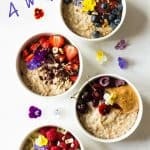 How should I adjust the recipe for the quicker-cooking kind of steel cut oats? Less time under pressure, or quicker release time? Hi Kim, I’ve never cooked other oats in the Instant Pot unfortunately so I couldn’t tell. You’ll have to give it a try. I would guess it’s just 1 minute high pressure and then natural pressure release but I can’t say for sure. I’m getting an Instant Pot for Christmas and will have to try steel cut oats. I like to eat savory oats for dinner with roasted veggies, goat cheese, and either a poached egg or smoked salmon. It’s so good! Oh wow!! I would never have thought of eating oats this way!! Thank you for the inspiration!! This is so good! Love my instant pot. ANother great recipe! What if I don’t have an instant pot, would the pats still come out good on the stove? Hi Rachel, you can absolutely make these on the stove in a regular pot. Simply add more water because the water will evaporate and cook for about 20-30 minutes, stirring often.